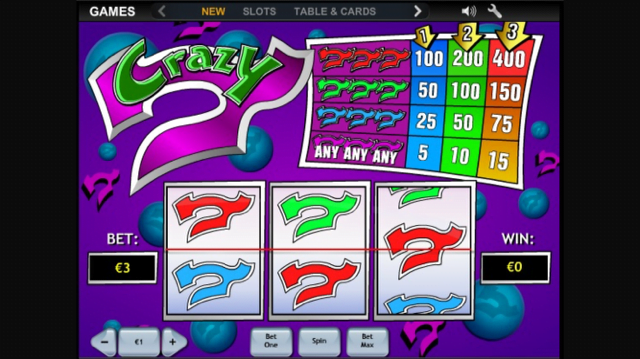 Crazy 7 slot machine from Playtech is one of the simplest and playable games in their game catalogue. It has just 3 reels, 1 payline and a max jackpot of 400x, but whilst that might sound pretty average, the game is strangely addictive on mobile. There are no bonus rounds, free spins or multipliers. Check out all the details of this fun little game in the Crazy 7 slot review below. For those of you out there who prefer a classic slot machine experience, Playtech’s Crazy 7 slot is about as simple as it gets due to its three reels, single payline and a complete absence of bonus features. Following the back-to-basics nature of the slot, the design is equally minimalist; with lucky sevens being the only icon to feature on the reels. These symbols appear in a variety of different colours with red sevens being worth the most and blue sevens being worth the least, but beyond that players won’t find so much as a substitute wild or a scatter icon to further complicate proceedings. The Crazy 7 slot machine itself is set to a bright purple background with all of the necessary payable information being displayed on the same screen, making it a pick-up-and-play title that can be enjoyed on any desktop, mobile or tablet device from as little as £0.01 per spin or as much as £15 if you’re willing. As mentioned above, if the Crazy 7 slot was any more simple it would be an animated gif; but there is one aspect to the paytable that is worth considering. This is the fact that mobile casino players will receive a small payout of 5x their bet for landing any combination of three sevens across the game’s central payline. While you might think that would make it impossible to lose on any given spin, icons can appear off-centre – essentially counting as complete blanks as far as payouts are concerned – but the fact remains that it is staggeringly easy to bag consistent wins and this is why the slot has a 97.21% RTP. It should also be noted that Crazy 7 is a game that gets progressively more rewarding the more coins that you invest, with three individual paytables available for players playing with one, two or three coins selected. While the first two lists are essentially the same, enabling all three coins will result in a jackpot of 400x rather than 300x, making it a worthwhile investment whatever your chosen value. Is it possible for a video slot to be too basic? We think so; and unless you have the attention span of a gnat there’s simply not enough going on in the Crazy 7 slot to make it worth investing your time or money. Like the Crazy 7 slot review? Check out these as well…..